Two further Stockton Town players have been selected to represent their country this week. Ryan Kirby and Sam Naylor who are both U15’s players have been selected to represent England U17’s at a prestigious international event for the Catholic Schools of Great Britain. With nations like Italy, Spain, Portugal and Brazil participating this will be a fantastic experience for the lads. A fantastic achievement for the lads and a well done from us all at Stockton Town. 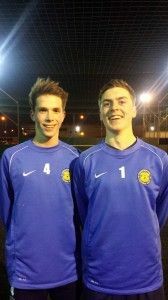 Ryan Kirby (Left) and Sam Naylor (Right) have both been selected to represent England. Sam Naylor – GK – left the club at the end of U13s season to sign for Leeds Academy and now is playing for York City at U16s level despite been an U15. Sam spent nearly 3 seasons at Stockton Town and was part of the squad that won the Durham County Cup. A big strong dominant keeper with good handling and reflexes. Ryan Kirby – CB – Ryan joined Stockton Town this season having spent most of his playing days at Newcastle’s Academy. Ryan has added football intelligence, quality and organisation to an already glowing squad. Ryan has now confirmed his first TJFA Division 1 Title this season helping the squad to 15 wins from 15 games.